ANKARA, April 4. /TASS/. Separating terrorist groups from the armed opposition in Syria is crucial for protection of civilians, says a joint statement signed by Presidents Vladimir Putin of Russia, Recep Tayyip Erdogan of Turkey and Hassan Rouhani of Iran at talks in Ankara on Wednesday. The document is posted on the Iranian presidential website. "Underlined that, in the fight against terrorism, separating the above-mentioned terrorist groups from the armed opposition groups that had joined and would join the ceasefire regime bore utmost importance with respect to preventing civilian casualties," the statement reads. "Reaffirmed their determination to continue their cooperation in order to ultimately eliminate DAESH/ISIL, Nusra Front and all other individuals, groups, undertakings and entities associated with Al-Qaeda or DAESH/ISIL as designated by the UN Security Council in Syria and underscored the success of their collective efforts in the fight against international terrorism," it says. Russia, Iran and Turkey will continue their cooperation in order to eliminate in Syria the terrorist organizations Islamic State and Al-Qaeda (outlawed in Russia) and the groups associated with them. The presidents of Russia, Turkey and Iran are confident that there is no military solution to the Syrian conflict. "The presidents expressed their conviction that there could be no military solution to the Syrian conflict and that the conflict could be ended only through a negotiated political process," the statement reads. 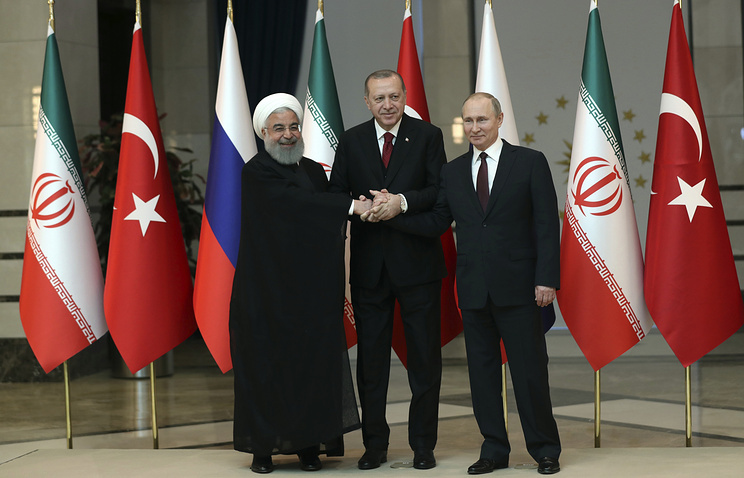 Putin, Erdogan and Rouhani "emphasized their strong and continued commitment to the sovereignty, independence, unity, territorial integrity and non-sectarian character of Syria. They highlighted that none of the actions, no matter by whom they were undertaken, should undermine these principles, confirmed by relevant UN resolutions and by the will of the representatives of all segments of the Syrian society. They rejected all attempts to create new realities on the ground under the pretext of combatting terrorism and expressed their determination to stand against separatist agendas aimed at undermining the sovereignty and territorial integrity of Syria as well as the national security of neighboring countries." The presidents have reaffirmed their determination to continue active cooperation on Syria. "The Presidents reaffirmed their determination to continue their active cooperation on Syria for the achievement of lasting ceasefire between the conflicting parties and advancement of the political process envisaged by the UN Security Council Resolution 2254," the statement reads. Vladimir Putin, Recep Tayyip Erdogan and Hassan Rouhani also "expressed their conviction that the Syrian National Dialogue Congress, which was convened in Sochi on 30 January 2018, constituted an important milestone in paving the way for the political process, reiterated their commitment to follow up on the results of the Congress, reflecting the will of representatives of all segments of the Syrian society, in particular the agreement to form a Constitutional Committee, supported by the UN Secretary-General and the international community. They reaffirmed their support to facilitate the beginning of the Committee’s work in Geneva as soon as possible with the assistance of the United Nations Secretary-General’s Special Envoy for Syria and in coordination with three guarantor states." The Astana format is the only effective international initiative that had helped reduce violence across Syria, according to the statement. "Expressed their satisfaction with the outcomes of the first year of the Astana meetings held since January 2017, underlined that the Astana format had been the only effective international initiative that had helped reduce violence across Syria and had contributed to peace and stability in Syria, giving impetus to the Geneva process in order to find a lasting political solution to the Syrian conflict," says the statement.